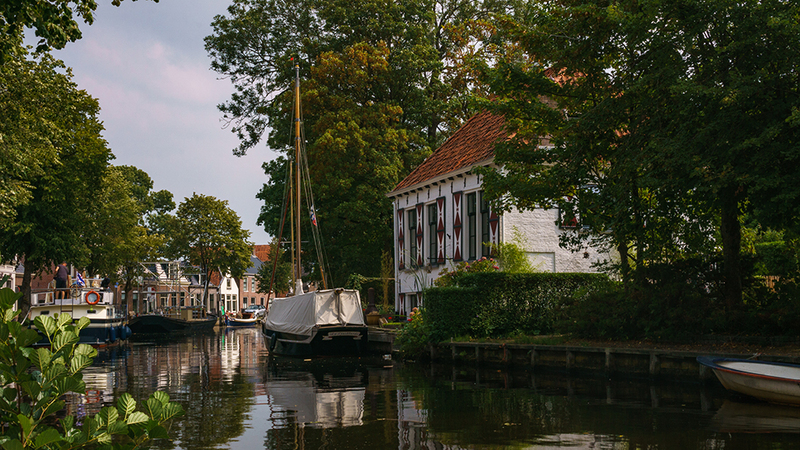 Do you want to visit one of the fairy-tale villages of Friesland and The Netherlands? And are you looking at the things to do in Aldeboarn, Friesland? Continue reading! Oldeboorn, or Aldeboarn in Frisian and the official name, is one of the most beautiful villages of Friesland and of The Netherlands that you will ever see. 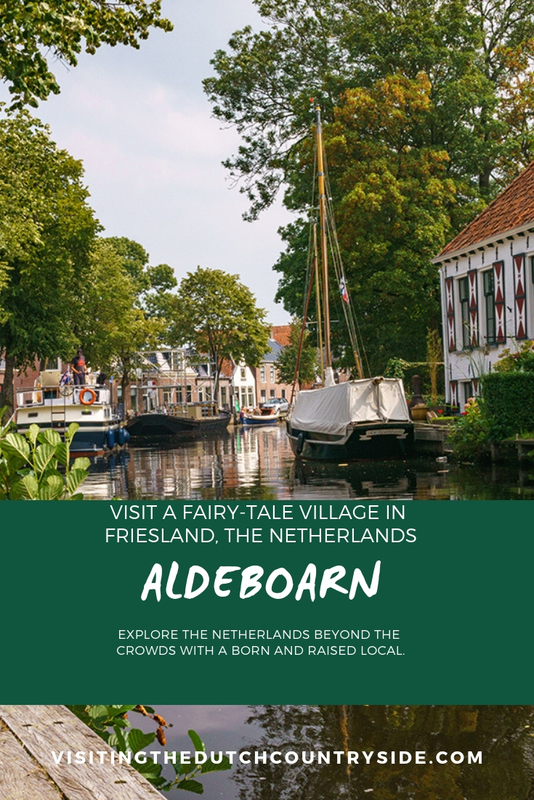 If you are looking for things to do in Aldeboarn, fairy-tales towns of Europe and off the beaten path places to visit in Friesland, then this is your article. The village can be described in two words. Calm. Idyllic. Besides that, the canal houses are very well taken care off and look so beautiful. There are no tourists in this town at all. Every now and then there are a few cyclists who pass you or you will see boats sailing through the main canal of Aldeboarn, Friesland. Everyone expects you to say hello (hallo in Dutch), so just say it to whoever you pass. This makes that Aldeboarn feels even cosier and ‘gezellig’. 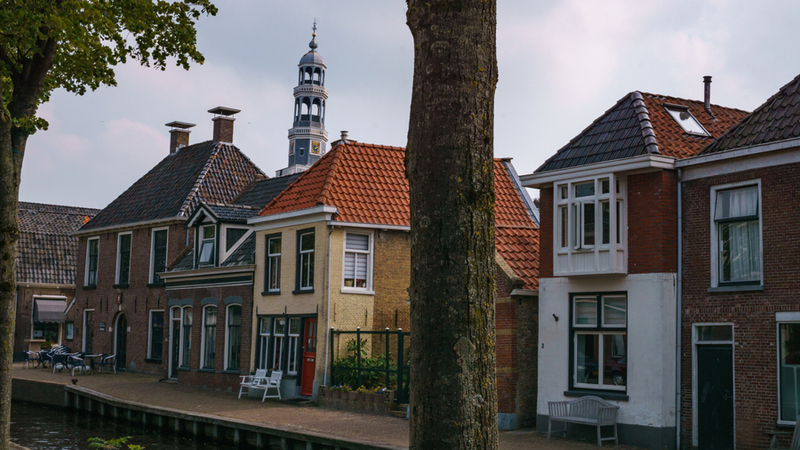 Aldeboarn is one of those villages that are small, but still one of the must-sees fairy-tale towns in Friesland. The village of Aldeboarn is one of the best small towns in The Netherlands, and one of the most scenic places in The Netherlands. 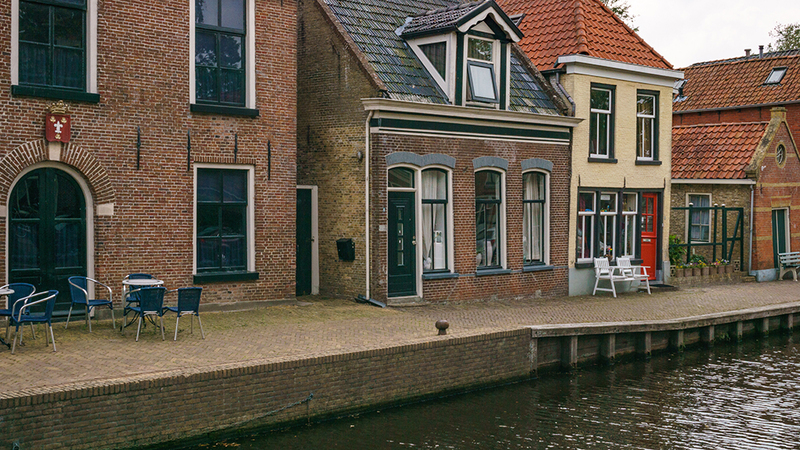 It has a rich history and was first named in 753 when it was talked about in the travel journey of Bonifatius together with the city of Dokkum. One of the best small towns in The Netherlands is Aldeboarn. And while the town itself is small, the area can keep you busy for a day. Here are the things to do in Aldeboarn, The Netherlands. Aldeboarn is a beautiful, old town which you can see when you take a look at all the buildings. So that’s first. Having a look at the monuments and most beautiful streets of Aldeboarn, Friesland. Waechstege, Andringastrjitte, Súdkant, Tsjerkebuorren, Weaze and Westein. Waag: The first monument that you have to take a look at is the Waag. This used to be a building for storages of cheese and butter and was built in the middle of the 18th century. Nowadays there is a little museum about the history of Aldeboarn in the waag, but as far as I’ve been told, everything is in Dutch. And the museum only opens when someone calls the owner or volunteer first, so the volunteer would give you a tour in Dutch. This would be a bit difficult for non-Dutch speakers to visit. Watzamastate: This is a farm that is built in the late 19th century which you can find at Easterboarn 9. Of course, you shouldn’t walk onto the farm as people live and work here. But you can see the farm from the road. It still looks exactly like it did back in the days. Andringa State: It used to be a manor house, however in the late 19th century a part of the house was destructed and into a rectory of the church. The other part was kept. Nowadays you can still see the part of the manor house which can be found at Lycklema’s Leantsje 1. Doelhofkerk: This church is from the beginning of the 18th century and is also called the Sint Pancraskerk. Aldeboarn is located at the start of the Turf route, or peat route. This is a route that you have to sail, thus you’d have to rent a boat. Rent a boat in Akkrum and you’re settled. At this website, they rent out boats from April until October. You’d have to Google Translate again or scroll down and send them an email. This way everything will be much clearer. Nature reserve De Deelen is a typical peat area where our ancestors have extracted peat and created agricultural land. You can walk through the area and find traces of the hard work of our ancestors. During the early Middle Ages, the area of De Deelen was incredibly busy. Nowadays, this nature reserve is a protected wetland. As the area is a wetland it is not accessible for disabled, there are many bridges that one needs to cross and oftentimes the paths are wet. You can get to De Deelen by bike or car from Aldeboarn. Keep this address in mind as your destination. Hooivaartsweg 4, 8459 ET Luinjeberd. This will bring you straight to the area. Once you have arrived at De Deelen you can take a walk of 1,5 or 3,5 km. The protected area of De Deelen opens every day from 7:00-18:00. 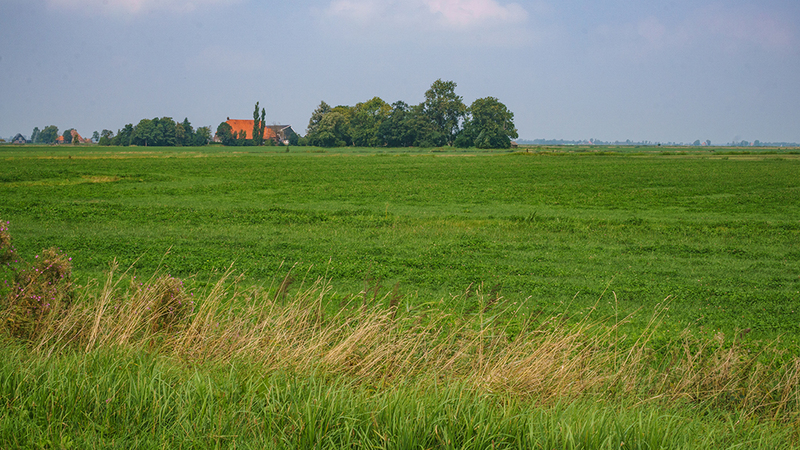 Take your bike to Goëngahuizen, which is a 15-minute bike ride from Aldeboarn, Friesland. Here you will find three windmills that are used to keep the water out or in the rivers. De Jansmolen and De Modderige Bol are 100 meters apart and the windmill Heechhiem is a kilometer away. They were all built mid 19th century. Godwits were chosen as the national bird species of The Netherlands in 2015. The black-tailed godwit is a bird that lives mainly in meadows. 90% of all the godwits couples in the world breed in The Netherlands. However, the population is decreasing rapidly due to habitat loss. During the month of May, the godwit is brooding. Make sure that you’re not going in any meadow during May-mid June, not even for a picnic at designated areas. If you are entering the meadow for a picnic the old godwits fly out of their nests and alert the young critter. The little godwit cannot fly yet, so it dives to the ground to hide. The issue with this is that the little bird has to be warmed up by the parents every five minutes, otherwise they cool down rapidly. If you stay in the meadow, the parents want to chase you away and cannot warm up their youngsters. In the result the young godwits cool extremely and die. How should you spot godwits? Patience. A lot of patience. You have the chance to spot godwits from February until June. After that, they head back to Western Africa. Cycle around the area of Easterboarn in the hopes you’ll find them. If you can fix yourself some binoculars, that’s even better. Akkrum is the bigger town nearby, that is actually also worth a visit. And if you’re visiting Aldeboarn by public transport, you have already set foot in Akkrum. Walk around Akkrum, Friesland and just relax. The town isn’t big, but if you’re in the neighbourhood it’s a fun place. Get plums at a farm at the intersection of the n392 and fjurlanswei. The plum season lasts from July until October. Bring cash if you want fresh plums! One of the most important events of Aldeboarn, Friesland is gondelvaart. Gondelvaart is one of the biggest cultural events held on the water of the province of Friesland and exists since 1945. Every year there are more than 8000 people that visit this event in Aldeboarn. A village with 1500 inhabitants turns into a town of 10.000 people within hours. During Gondelvaart you’ll see around 15 floating objects that are basically full theatre productions. They sail on the river that flows through Aldeboarn, The Netherlands during the dark. And it’s a real treat to see. The entry is 7 euros for everyone who is older than 12. The event always takes place at the end of August. Before the official Gondelvaart begins there is a Gondelmarket (market) which starts at 17:00. The event itself starts at 21:00. For more information you can Google Translate this page, however, I have mentioned the most important things. There are not many options in Oldeboorn, as Aldeboarn is one of the many small fairy-tale villages of The Netherlands. There is an old, traditional ‘bruin’ (brown) cafe in Aldeboarn that is worth a visit. It is called Café Moeke de Bruin. It opens 6 days a week from 19:00-02:00. For a drink, or a bite you can go here. On Monday Café Moeke de Bruin is closed in Aldeboarn, one of Friesland and The Netherlands most scenic places. Café De Post is another place. This is a café and snack bar (snacks as kroketten) and opens 6 days a week. It is closed on Tuesday. Monday – Saturday from 16:00- 00:00. Sunday 16:00- 23:00. If you want to spend a night, or a few nights, in the area of Aldeboarn then Boarnshiem boerencamping could be perfect. This is a camping, located next to a farm, not too far out of the village of Aldeboarn, The Netherlands. 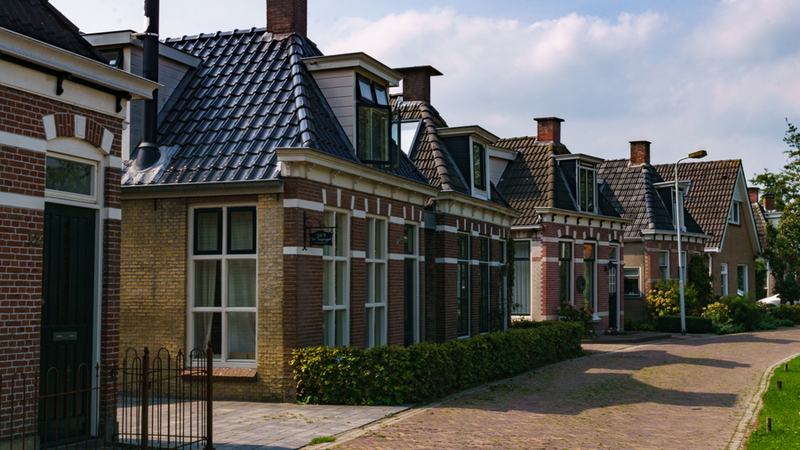 Another option is to stay a hotel in the nearby town of Akkrum, Friesland. Click here to see the prices of Hotel Restaurant Goerres in Akkrum. To get to Aldeboarn (Oldeboorn) in Friesland, The Netherlands by public transport you can follow this route. One way to get to Aldeboarn, Friesland is to take the train to Akkrum and then cycle to Aldeboarn. It makes for a beautiful bike ride. If you chose this option, you’d have to buy an extra train ticket via the machines for your bike. This bike ride will take you around 15 minutes. The second way is to get to the train station of Akkrum and take a bus. You’d have to call a number at least an hour before you arrive so the bus can take you to your destination. You need to take Arriva belbus 11 in the direction of Nij Beets. Have a look at 9292.nl for more information. If you are wondering where Friesland, The Netherlands is, what the capital of Friesland is and find other things to do in the Friesland province, click here for the general page of Friesland. Was this article useful for you? Would you like to visit Aldeboarn or have you visited already? Is there something else you’d like to know? Share this post!! Next PostNext The 13 best budget -friendly hostels and campings in Amsterdam, The Netherlands | Under 35 euros a night!